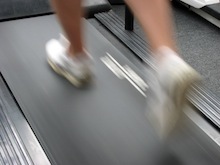 A clinical trial at Emory studied whether an experimental treatment could help patients with peripheral artery disease walk longer on a treadmill. A blood cell growth factor can boost the effects of exercise in improving mobility for patients with peripheral artery disease, a clinical study has shown. The results were presented Nov. 18, 2013 at the American Heart Association Scientific Sessions meeting in Dallas. Researchers at Emory University School of Medicine were testing whether GM-CSF (granulocyte-macrophage colony stimulating factor), already used to restore white blood cell numbers during cancer treatment, could help heal blood vessels damaged by atherosclerosis. In peripheral artery disease, patients’ legs have trouble getting enough blood during exercise, leading to impaired mobility and pain after exertion. The primary outcome measured in the study was how long participants could walk on a treadmill two months after a four-week course of either GM-CSF injections or placebo. "We saw a modest increase in treadmill walking time for patients treated with GM-CSF, compared to placebo," says study leader Arshed Quyyumi, MD, professor of medicine at Emory University School of Medicine and co-director of the Emory Clinical Cardiovascular Research Institute. "However, we also saw something encouraging. The patients who strongly responded to GM-CSF, measured by the levels of progenitor cells in their blood, also saw more benefit in terms of maximum walking time. Changes in the dose and duration of GM-CSF treatment could possibly enhance therapeutic benefit, and this needs more investigation." At the start of the study, both groups could walk on a treadmill for a maximum of about five minutes. On average, study participants who received GM-CSF had their maximum walking time increase almost a minute (53 seconds) more than the placebo group, although the difference was not statistically significant. Both groups of patients were encouraged to walk several times per day, and both GM-CSF and placebo groups saw increases in their ability to walk (30 percent increase for GM-CSF compared to 21 percent increase for placebo). A total of 159 patients participated in the phase II study, all at Emory-affiliated medical centers from 2010 to 2012. GM-CSF is thought to act by moving progenitor cells out of the bone marrow so that they can replenish the linings of blood vessels. In the Emory study, there was some variability in how much individual patients responded to GM-CSF. Some patients who received GM-CSF experienced above-average increases in the levels of progenitor cells, defined as carrying the marker CD34. They also experienced greater increases in their ability to walk, with treadmill times in this group increasing more than two minutes on average. Overall, the PAD patients’ responses to GM-CSF were less than what has been observed in healthy individuals. This may be because of poor health and especially atherosclerosis have affected the health of the bone marrow, although people with recent heart attacks or other severe disease were excluded from the study, Quyyumi says. Participants had an average age of 64 and 37 percent of them were diabetic. However, age and diabetes did not predict patients’ ability to respond to GM-CSF. The study was funded by a Grand Opportunities grant, part of the 2009 American Recovery and Reinvestment Act, from the National Heart Lung and Blood Institute (5RC2HL101515). The first author of the abstract being presented is cardiovascular research fellow Joseph Poole, MD.